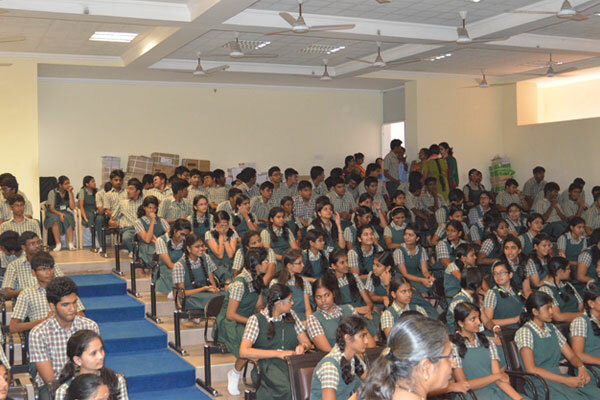 The inauguration was held at Tamil College, Perur with the blessings of His Holiness Sri Marudachala Adigalar. 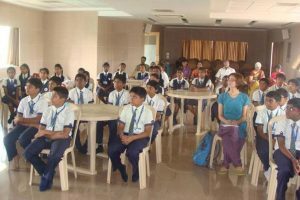 Dr. Ram Manohar, Research Director, Arya Vaidya Chikitsalayam was the Guest of honor. 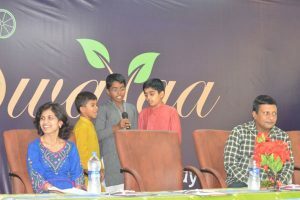 Our kids Sunethra and Vrishangan entertained the audience with the puppet show to create awareness about vegetable gardening, followed by recitation of Mangala mantra by our kids, Vaibhav, Gagan and Dhananjay. 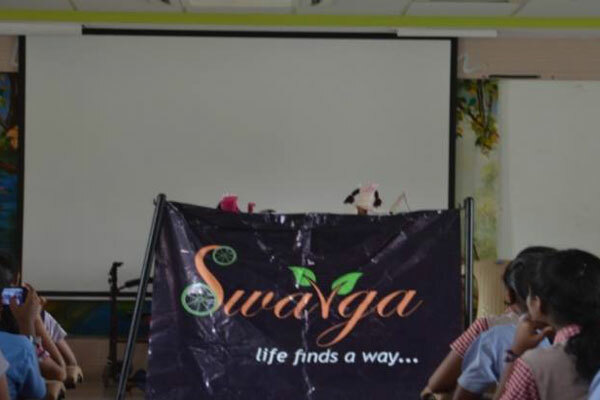 Swarnalatha, Managing trustee emphasized to the audience the reasons behind starting Swarga Foundation. 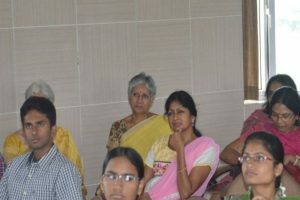 The function concluded with vote of thanks by Guruprasad, Trustee. 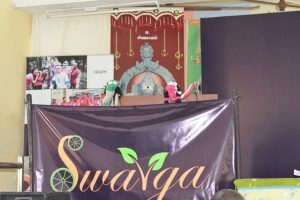 Swarga Foundation at Siruthuli on 21-Nov-2014 to create awareness about vegetable gardening through puppet show performed by Ms.Delphina Rex and Ms.Swarnalatha, Managing trustee. 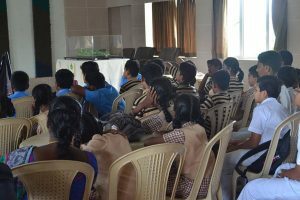 Ms.Swarnalatha also pointed out the ill effects of over-exposure to technology, consumption of junk food and the benefits of growing our own food. 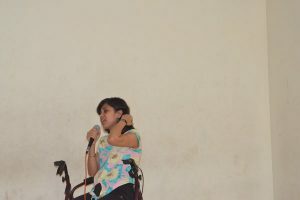 Thanks to Siruthuli for providing us this platform and exceptionally talented Delphina. 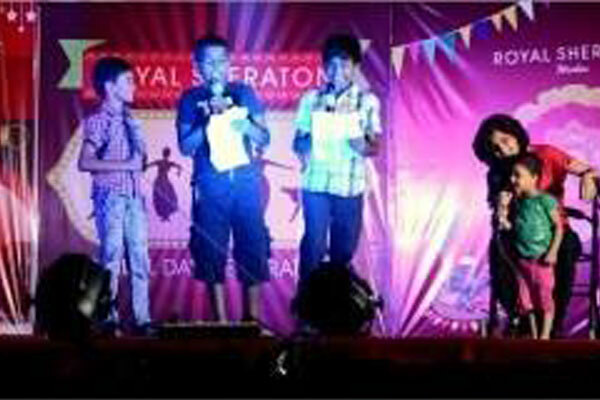 We also distributed pamphlets about kid’s safety. 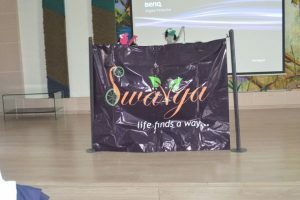 Swarga Foundation at Siruthuli on 28.11.2014 to create awareness about Water Conservation through puppets by Ms.Delphina Rex and Ms.Swarnalatha, Managing trustee.The audience stood in awe with the puppets, their humorous and witty advice on saving water. Swarga Foundation at Siruthuli on December 5, 2014 to create awareness about Water Conservation through puppets. 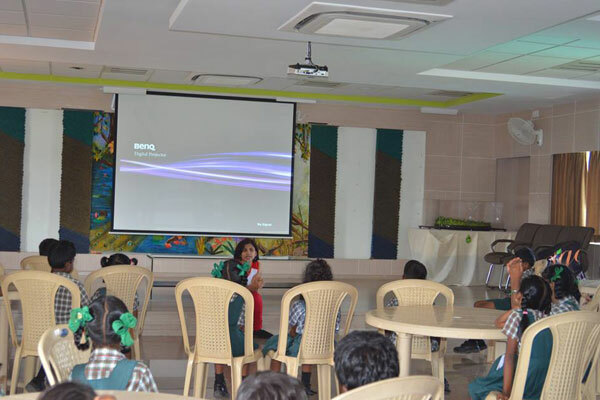 Ms.Delphina Rex and Ms.Swarnalatha, Managing trustee performed. The puppet show much to the amusement of the little ones from The Ideal Mount Litera Zee School. 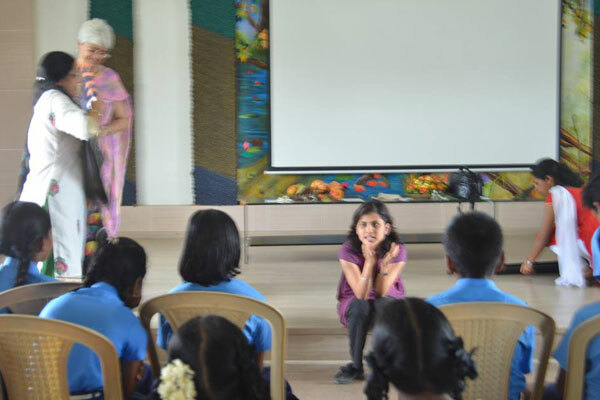 Swarnalatha also emphasized the importance of camaraderie and kindness among children. The Kids safety pamphlets were distributed to all the kids as part of our Child Abuse Prevention initiative. Swarga Foundation performed a puppet show on Water Conservation at Siruthuli on Dec 11, 2014. The show was performed by Ms.Swarnalatha, Managing trustee and Ms.Delhpina Rex to an audience of 70+ members. 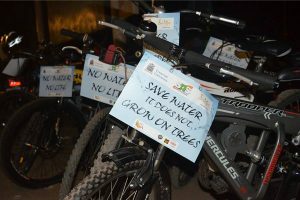 The show highlighted the importance of water, tips of saving water and reduction of water wastage. The show was attended by Siruthuli Managing trustee, Smt. Vanitha Mohan and other dignitaries of Coimbatore. 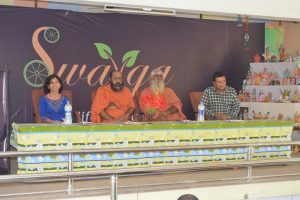 Swarga Foundation at Arya Vaidya Pharmacy(AVP, Ramanathapuram, Coimbatore) on January 10, 2015 to create awareness about Water Conservation. 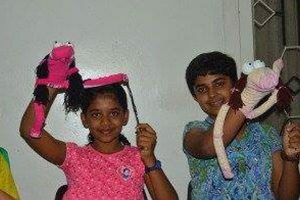 Kids, Sunethra and Shrinika put up a good show to convey the message with the Puppets. The patients and the caregivers at the hospital were dumbstruck at the performance of the children who were using art to convey the message. 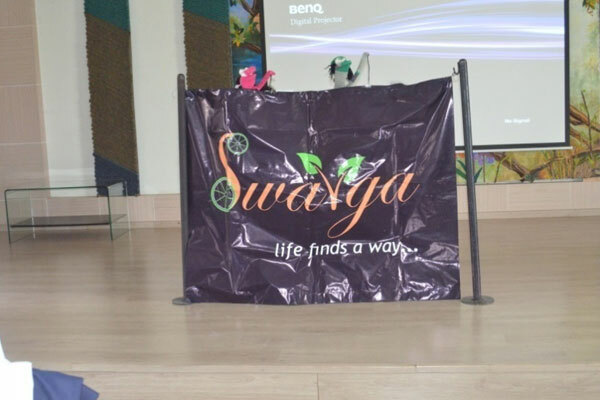 Swarga Foundation @ Royal Sheraton Apartments on Jan 11, 2015 to create awareness about Water Conservation through puppets. 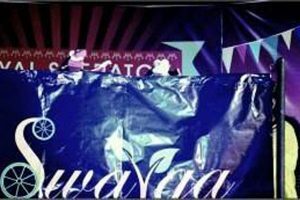 Sunethra, Shrinikha, Dhruvakarsh, Vaibhav, Gagan and Gaana put up a great show. SWARGA FOUNDATION @ Vidhya Niketan School, Coimbatore, Vilankurichi Campus on Monday, April 6, 2015 to create awareness about Water Conservation through Puppets. Children, Sunethra and Shrinikha put up a brilliant show. The show followed by the screening of the film “Life Finds a way”. 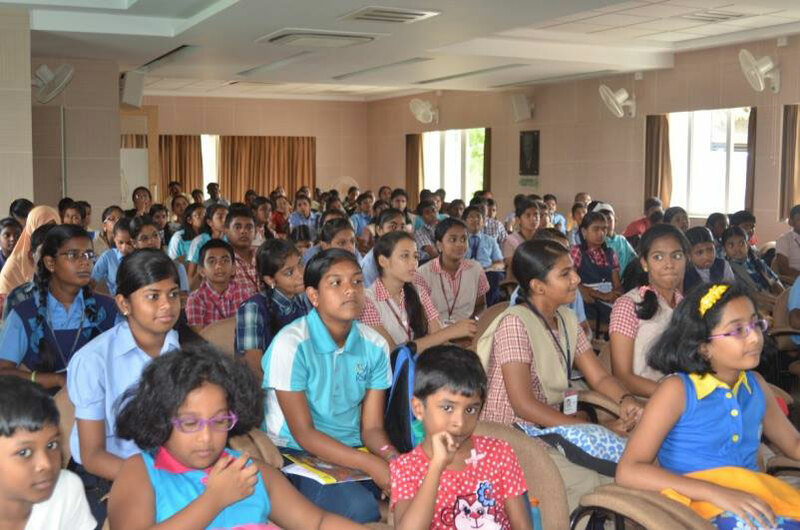 The 150+ students of Class 12 and their teachers actively participated in a question and answer session too. We thank the Founder & Correspondent of the school, Smt. 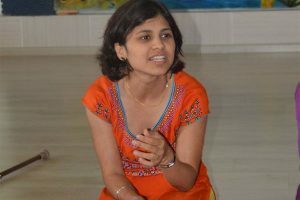 Rajini Krishnamurthy for considering us to provide value-addition. 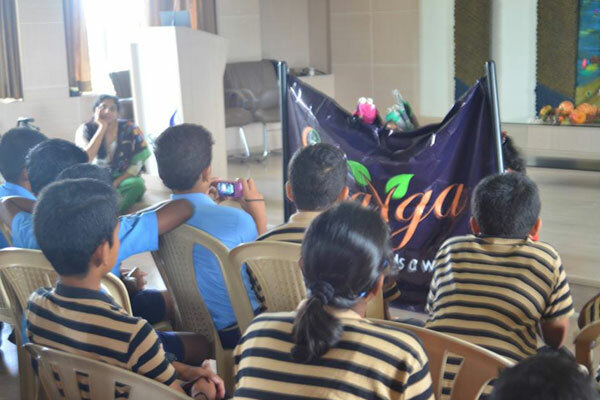 Swarga Foundation @ Siruthulion Day 2 of Nurture Nature Camp of to perform a puppet show on waste segregation for the children attending the summer camp. 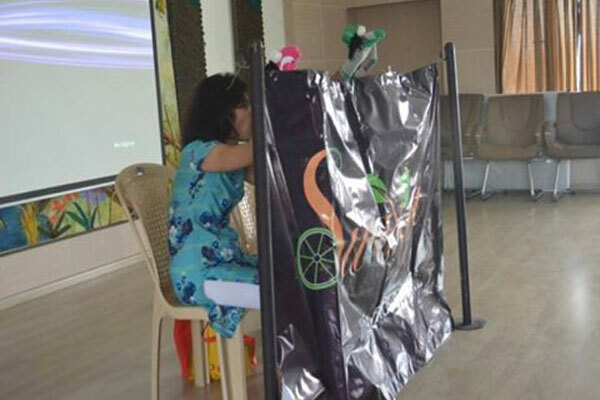 Ms.Swarnalatha, Managing trustee and Ms.Delphina Rex, Sirthuli volunteer put up a puppet show to spread messages like segregating the waste, recycling the waste and withholding the dignity of sanitation workers. More than 100 children from various schools across Coimbatore participated in the camp. 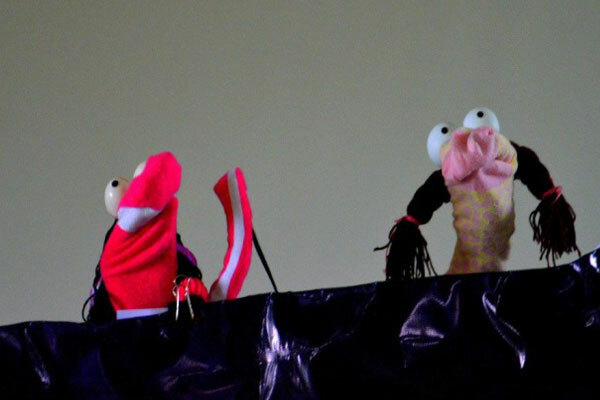 Swarga Foundation @ Siruthuli on June 26, 2015 to create awareness about WATER CONSERVATION through puppets. Siruthuli’sDelphina Rex and Swarnalatha entertained the audience with their witty conversations. 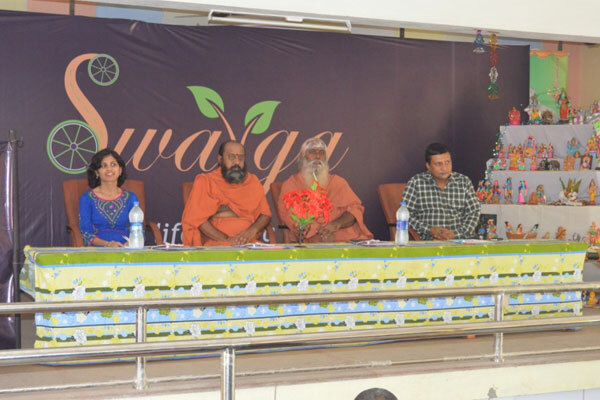 Swarga Foundation @ Siruthuli on July 3, 2015 to create awareness about Vegetable Gardening through puppets. 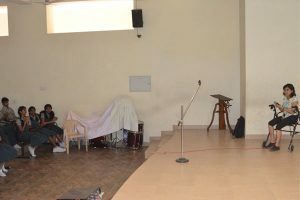 Siruthuli’s Delphina Rex and Swarnalatha entertained the audience with their witty conversations. 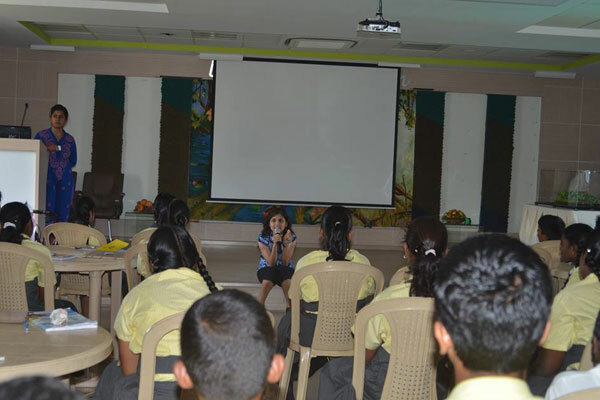 Swarnalatha also highlighted how exercise, food, relaxation and thoughts can affect one’ health. Swarga Foundation @ Siruthuli on July 17, 2015 to create awareness about Water Conservation through puppets. 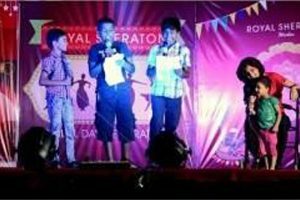 Show was performed by Delphina Rex from Siruthuli and Swarnalatha. Swarna also shared a story as to why compassion and kindness are important in character building. Swarga Foundation @ Siruthuli on July 31, 2015, addressing the tiny tots from Global Pathway School about importance of water in our lives. The kids enthusiastically watched the puppet show performed by Swarnalatha and Delphina Rex, which suggested that how making few lifestyle changes can help them save water. 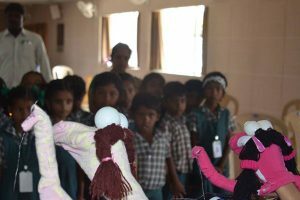 Swarga Foundation @ Siruthuli to create awareness about Vegetable Gardening through puppets. Swarnalatha & Delphina Rex also pointed out the ill effects of technology and how important healthy food is, to have healthy mind and healthy body. 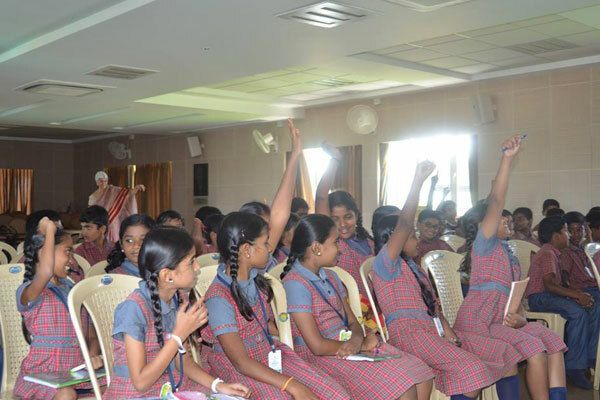 The children from Jayendra Saraswathi school were energetic and brilliant who promised to try to their hand at vegetable gardening. 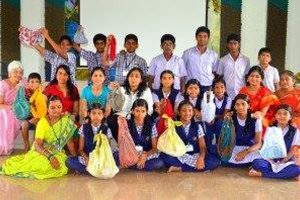 We immensely thank Siruthuli for providing us this opportunity. Swarga Foundation, in association with Coimbatore Municipal Corporation and SNS Institutions, organized “Save A Drop Cyclothon” on Sunday, February 14, 2016 at Singanallur Boat Club. The ride began at 6 am with more than 100 participants and the youngest participant was 4 years old. 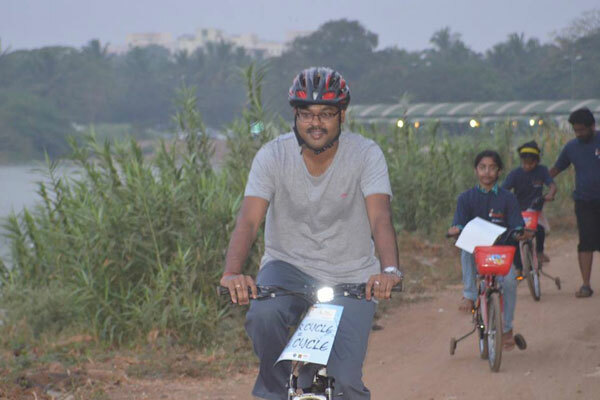 Participation of Dr. K Vijay Karthikeyan, the Commissioner of Municipal Corporation, Coimbatore in the ride was a great motivation to the cyclists. Swarnalatha J, Managing Trustee of Swarga Foundation & Mr.Balasubramaniyan, PRO of SNS Institutions flagged off the ride. 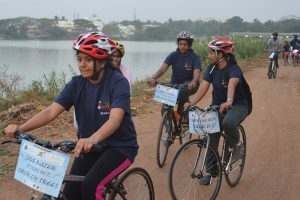 The ride started from Singanallur boat club covering the tank bund area amidst the picturesque view of the Singanallur lake. The sighting of rare birds was a visual treat. 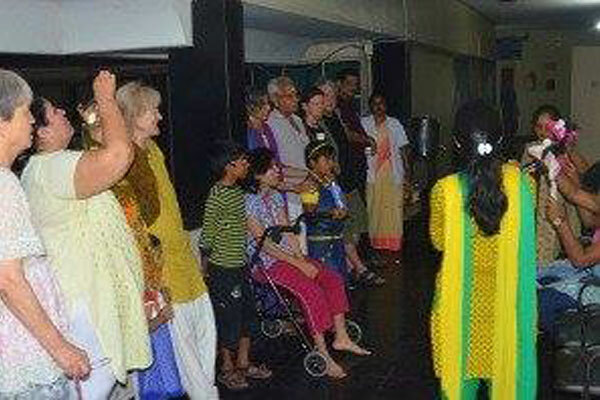 Participants took a break to quench their thirst with tender coconuts. 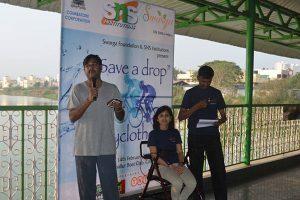 Upon completion of the ride, a puppet show was performed by Delphina Rex and Shrinikha, members of Swarga Foundation to highlight the need for water conservation. 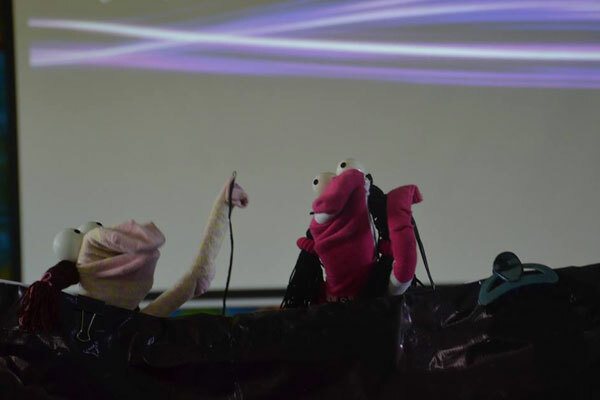 The witty conversations of the puppeteers kept the children spellbound. Dr. K Vijay Karthikeyan addressed the gathering and stressed the need for judicious use of this precious resource. 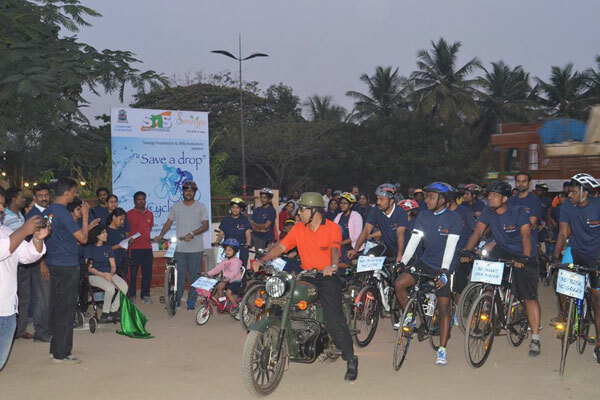 Guruprasad, Trustee mentioned that such lakes and wetlands need to be preserved for our well-being and through this awareness ride, all of us will be instrumental in safeguarding our natural wealth. We thank all the participants and their families for making it here on a Sunday morning. We would like to thank Dr. Vijay Karthikeyan for having graced us with their presence. Our gratitude to the volunteers of SNS Institutions and Swarga Foundation for the selfless work. Our heartfelt thanks to our unsung heroes, our event partner, TNT India for having ensured that the cycles were collected from different parts of Coimbatore and returned to the participants without any hiccups.